Not only did I get some fun photos of fishing poles and of the boat, but I shot a bunch of landscape and stock photos while trolling along the West shore of Lake Tahoe. The quickly changing shoreline can be a lot of fun shooting from a boat. 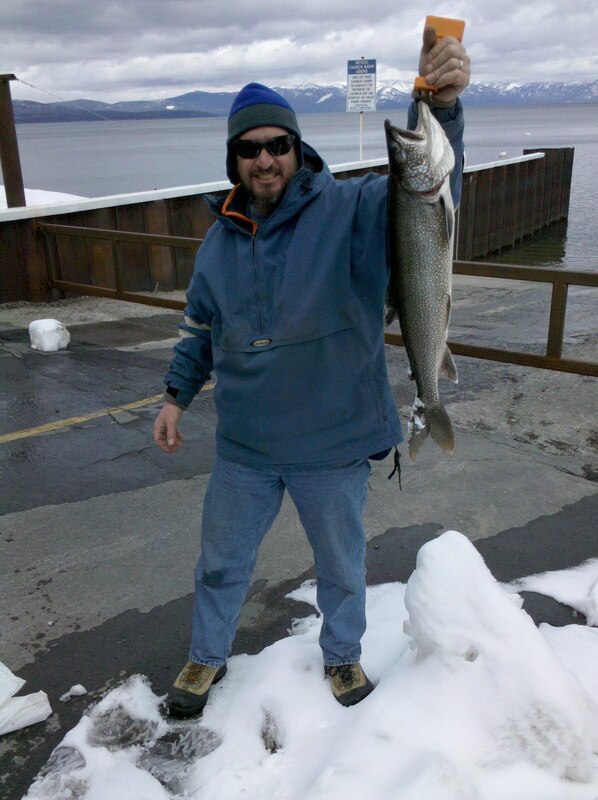 When shooting Lake Tahoe from a small fishing boat, weather resistant gear is highly recommended. I bring minimal gear, my Canon 5D Mark II, a 24-105 L lens, a flash which I've never used out there, and a polarizing filter. The small camera bag fits into my small dry bag, which gives me peace of mind when I'm not shooting. Both times I've been out this spring it has snowed or hailed on us. The weather can change fast but can provide some beautiful scenery. Dress warm with layers and a waterproof jacket if you suspect you may encounter some weather. I'd also recommend bringing a rag to wash and dry your hands between fishing and shooting for obvious reasons. I wish I could give some great fishing tips, but as I mentioned, I got skunked both times. 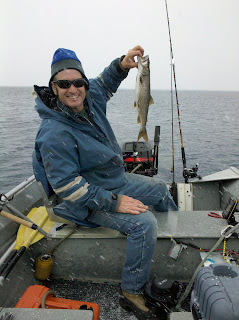 My buddy caught his big Mackinaw on our first trip with a red and blue pattern Rapalla in about 15 feet of water. The waves were a bit too big for his boat when we came around a point so we had to U turn and head back to the calmer waters. Right then he snagged a "rock", we turned around again to save the lure, and when we got closer, he realized he had actually hooked a huge fish. The Lake Tahoe photos in the slideshows above are available as fine art prints, gift items, and as stock photography. Click on the slideshows for purchasing information. Thank you.